ASTM A325 is an ASTM standard for heavy hex structural bolts, titled Standard Specification for Structural Bolts, Steel, Heat Treated, 120/105 ksi Minimum Tensile Strength. It defines mechanical properties for bolts that range from 1⁄2 to 1-1⁄2 in diameter. The equivalent metric standard is ASTM A325M, which is titled Standard Specification for Structural Bolts, Steel, Heat Treated 830 MPa Minimum Tensile Strength. It defines mechanical properties for sizes M12–36. There is also a T version, which is used to refer to fully threaded bolts. 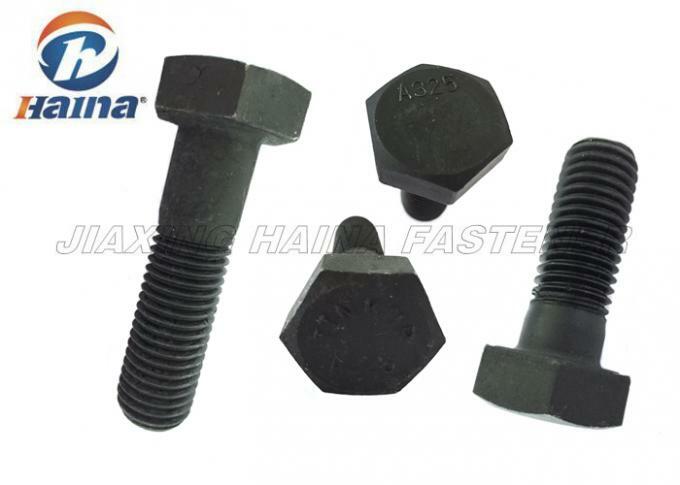 heavy hex structural bolts is a kind of high strength bolts, which is standard parts also. Securing better performance for the steel, engineering, fastening effect. General steel, steel bolts are required more than 8.8, there are 10.9, 12.9, and steel are all high strength bolts. Dimension Metric size from 6mm-100mm, Inch size from 1/8"-2-1/2". Surface treatment treatment: Plain, black finished, Zinc plated (Galv), Hot DIP Galvanized, Nickel, phosphate black, DACRO coating, etc. These bolts are intended for using in structural connections. These connections are comparable to those covered under the requirements of the Specification for Structural Joints Using High-Strength Bolts, approved by the Research Council on Structural Connections, endorsed by the American Institute of Steel Construction and by the Industrial Fastener Institute. In order to achieve the best possible joint, it is recommended to install the screw through the opposite side of the head, although it is possible to install the screw from the top face side. Production process: wire rod, wire drawing, drawing, cold forging, threading, dipping, inspection, packing, shipment.